One of my most popular product offerings are collages. They can be ordered as large or extra large prints or canvases, and they offer an amazing option for clients who are looking to include several images from the shoot within a single wall display without investing in separate wall pieces. When I style photo shoots, I choose colors and setups so they are complementary throughout the entire session so they can subsequently be combined within a single collage or a wall arrangement. They are beautiful and would look great in any part of your home! 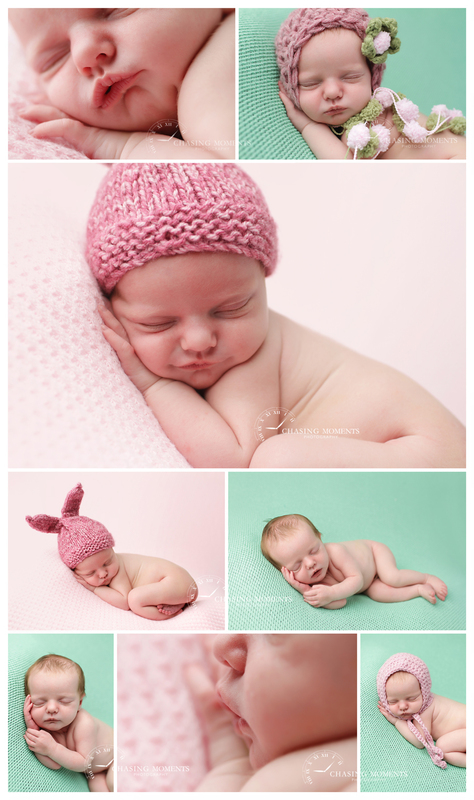 Here is an example of a collage for a newborn baby girl from Falls Church, Northern Virginia, who I photographed last May (yes, yes, I am behind on blogging, I know! 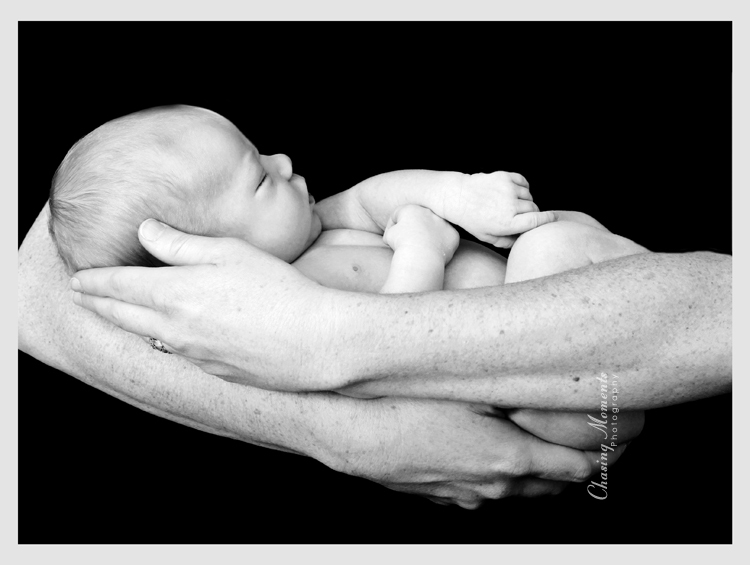 ).Â Every client gets to see a few sample arrangements including newborn setups and family shots in their proof gallery. A couple of weekends ago I welcomed a newborn baby boy C. and his mom J. at my studio.Â Baby C. turned two weeks old on the day of the session – a perfect age for a newborn session! J. and I picked a couple of simple and classic setups as well as a couple of creative ideas to shoot. J also wanted to do a couple of mommy-and-me portraits as well. I have so many favorites from this session! C. was really great posing on his tummy and the setups we chose look really great both in color and in black and white! Hope J. likes the images, I know I do! When clients ask me about scheduling a “studio” versus an “at home” newborn session, here are the factors I suggest to consider: if you are looking for a photo session mostly focusing on portraits of the baby and if you like using props and staged setups, then studio is a good choice for the session. My home studio is set up for newborn sessions to assure the easiest and the most seamless transitions between different props and backgrounds. If you are looking for a more balanced photo session including both newborn portraits and family shots (parents, mommy-and-baby, daddy-and-baby, sibling shots) then I recommend an “at home session” where there is more opportunity for both posed and photojournalistic/candid portraiture. If siblings and grandparents are involved I usually highly recommend an “at home” session. And I am totally in love with this “swing” shot – it looks so peaceful and wonderful and organic! I also really like how the black and white and the color versions have very different feels to them. Thanks for looking through this post to the end! I know it is important for potential newborn clients to get a peek into photographer’s recent work and into the type of shots they may get from a photo session. If you like what you saw, please check out the newborn slideshows on my main photography page, and drop me a line – I’ll work with you to create the images you want! When to Book Your Spring Flower Outdoor / Natural Light Photo Session? Spring is in the air! Northern Virginia is boasting a beautiful mid-70s degree weather almost every day now and many of you are starting to think about booking your outdoor natural light spring photo session to get some kids or family pictures with some of those pretty flowers or cherry trees you see blooming around. Well, you’d better hurry! NOW is the time to contact your family photographer. Some of the best professional outdoor photographers book their sessions at least 2-3 weeks in advance, so their schedules fill very fast. During high season, top outdoor photographers book 4-5 weeks in advance. Spring happens to be the popular “high season” due to its vibrant spring blossoms and beautiful temperatures and most outdoor sessions “with flowers” happen between mid-March to early-mid May. If you work with an established photographer, it is likely that her schedule for spring is already filled until mid- to late April!!!! Most cherry blossoms will be gone by then (the Cherry Blossoms around the tidal basin in Washington DC are scheduled to have peak bloom next weekend, two weeks ahead of regular yearly peak time! ), and many of the spring flowers will be gone as well. While the Tidal Basin seems to be an obvious choice for a family photo session to capture beautiful cherry trees in bloom, I generally recommend scheduling your outdoor session elsewhere (avoiding all the crowds who gather for the Cherry Blossoms , especially with kids, can be a tremendous challenge if you are looking for some peaceful relaxed spring time images). Northern Virginia has a couple of wonderful gardens with blooming Cherry Blossom trees and colorful flowers (Meadowlark Botanical Gardens in Vienna, Green Spring Gardens in Alexandria), Maryland, MD, residents have the option of going to the beautiful Brookside Gardens. Or, your neighborhood may have some beautiful blooms as well – I am sure your photographer will be happy to come out there for a photo session! If you do not have a go-to photographer for all your family pictures, feel free to contact me with any questions! I am currently booking sessions for mid-April, but I have some availability for early April as well. I also do “mini-sessions”, so please inquire for details and pricing! Enjoy the awesome weather, Northern Virginia! One of the properties of a digital image is its dimension in pixels – length and width. My camera is an 18-megapixel camera and records digital files that are 5184 pixels long and 3456 pixels wide. Its ratio of length to width is 3:2, which means that digital files can make 3 by 2; 6 by 4; 12 by 8, 24 by 16 prints without cropping (in other words, there is no cropping as long as the original ratio is preserved). Every camera is different in regards to the length-width ratio of the images it records, there is no set standard. The image below is straight out of camera without any cropping, it has a 3:2 length to width ratio. Now, let’s see what happens if we use this digital file to make a 5 by 7 print. The shaded area below represents the part of the original image will be cropped out. The “long” side of the resulting print will be slightly cropped. The composition of the final print will not be as pleasing as the original because the child’s sweater is too close to the print border, but no important part of the image will be lost due to cropping. Cropping will be even more substantial if we choose to make an 8*10 (or a 16*20) print. Unfortunately, this kind of cropping is unacceptable as a significant part of the main subject in the photograph is going to be lost due to cropping. I usually recommend that if my clients receive digital files from me, they should check how their images will be cropped before printing. Most online and in-store printers give “previews” of how a printed image will look and have tools that allow customers to recompose their images for printing. As a photographer, I usually compose my shots with a little extra “space” on all sides so that no important part of the image is lost later due to cropping for print.